Often agencies and policy makers become reliant on a handful of approaches that they use to influence behaviour. This post introduces the 6 E’s framework as a a framework for agencies wanting to utilise a broader suite of policy approaches to more effectively encourage different groups and sectors to be mobilised, supported and encouraged to participate in the “common enterprise” of generating positive outcomes’. It links policy development with systems thinking and adaptive management. There is a growing range of complex policy areas, so-called ‘wicked’ problems, where it has become increasingly clear that government cannot simply ‘deliver’ policy outcomes to disengaged and passive sectors and publics. In these areas (e.g. natural resource management, public health, poverty, education, the environment) it is clear that achieving significant progress requires the active involvement and cooperation of a great number of groups and individuals.Yet all too often we approach these issues with linear and even siloed solutions that aren’t sufficient to address the problems at the scale at which they exist. Successful outcomes from addressing these ‘wicked problems’ increasingly depend on the coordinated actions of decision-makers at different levels – from individuals and communities to enterprise and sector organisations, to region and nation (policy agents). This is where concepts such as partnerships and co-design come into play. By sharing information, resources, activities, and capabilities we can achieve things together that we could never achieve alone. Even where the issue is not necessarily seen as complex, it is often crucial that a range of stakeholders and publics get actively engaged to achieve desired outcomes . This recognition has led to a focus on co-design where the achievement of outcomes is seen as a joint responsibility of the government, key stakeholders and the wider community. While many policy drivers are still evolving from the mass production model (often regulation and legislation) of earlier times, there is growing interest in focusing beyond the internal workings and efficiencies of existing services, and looking more closely at how people engage with those services, and how different groups and sectors can be mobilised, supported and encouraged to participate in the “common enterprise” of generating positive outcomes’. This growing realisation has led to a shift of interest towards models of ‘co-design’, which recognise that policy makers may often have more impact on key outcomes by using their limited resources to engage, involve and influence the behaviour of users and other parties, rather than concentrating on traditional modes of providing services. Influencing behaviour is not a linear process where policy makers enforce a particular policy with a distinctive and well-defined effect. Policy success depends on many factors and particularly on the cooperation of different groups of society. Accordingly contemporary policy trends are recognising the need to creatively utilise the multiple mechanisms available in designing approaches to promote action on environmental and other complex issues. There are a range of policy choice tools that aim to link theory and practice, and in general these encourage policy makers to use a mix of options – taking the context and stakeholder characteristics into account. In this posting I look at DEFRA’s 4Es policy framework (see Figure 1 – centre circle) as one such tool which provides a framework to help policy makers develop a mix of interventions across four broad categories of policy tools – Enable, Engage, Encourage and Exemplify. More recently the UK Behavioural Insights Team through its Mindspace report has added two additional “E”s (see Figure 1 – outside circle) that round out a process of informed policy design and results measurement. Using this tool as a checklist can help agencies to more effectively influence behaviour by combining approaches across these six broad categories. Figure 1: No single solution – the 6Es model provides a framework to help design a mix of interventions within a broader systemic design and collaborative learning approach.. Collectively, the approach and the mix of measures drawn from across the 4Es need to address the core motivations and barriers of the broader range of stakeholders involved – including agencies themselves. For example, it’s likely including measures that engage and enable will lead to “change” through those most willing and able to act. It’s also feasible that some other groups may act if agencies demonstrate their own willingness to “walk the talk” and model the collaborative behaviours they would like to encourage. For others there is a role for regulation, or the development of minimum or voluntary standards before behaviour is influenced. Each element encompasses a suite of potential approaches and some of these are indicated below. Enable – We need to start where people are. This makes it easier for people to make the right choice. What is important is that people and sectors are provided with the support they need to make responsible choices (e.g. by putting the right infrastructure and services in place, building skills, removing barriers, training). Engage – It is important to get people involved. Effective public engagement is necessary to provide legitimacy for interventions that may be introduced. As David Pollack reminds us, “behaviour change can be controversial, involve difficult tradeoffs, and concern areas where government legitimacy is controversial. These questions are both tricky and of general concern to the public.” This may require new methods of engagement and co-design to explore what actions are socially acceptable or to gain legitimacy for a proposed practice change. In this areas agencies could leverage networks, work with trusted intermediaries and champions, and build a shared understanding through the use of dialogue and learning-based approaches. Encourage – This covers the broad range of approaches that agencies have to encourage change (e.g. regulation, minimum standards, social marketing). It requires developing and putting in place incentives (in their broader sense) to encourage – and disincentives to discourage – a target audiences response. Providing feedback on progress is also important in this respect. One set of principles for encouraging change can be found in an earlier LfS post – Sustainability: six ways to influence behavior change. important. This requires those designing change to lead by example and to ensure that the actions of the policy agents are consistent with the change being sought. This puts the onus on agencies and policy partnerships to review their internal policies and take action to ‘exemplify’ the same behaviour they are asking for (e.g. demonstrate the ability to work in a partnership, collaboration, ensuring mesages are consistent across agencies). The final two E’s – explore and evaluate – serve to embed the 4 E’s in a broader process of informed policy design and results measurement. This brings in concepts of systems thinking, systemic design, learning, reflective practice and adaptive management and policy. Together, exploring and evaluating create a broad learning environment through which the development and implementation of policy and management can adapt. A related post on this site – After action reviews and how they can be linked with ToCs to support strategic thinking – highlights how the 2 E’s can be used in tandem to create both the space and guidance for strategic learning, and subsequent adaptation and innovation. Explore – Understanding the issue and the wider context in which it is sited. This needs to include inquiring into how the different stakeholders involved experience things and to understand the behaviour that is being targeted. Broad approaches such as systems thinking and systemic design are particularly useful in this setting encourages us to explore inter-relationships (context and connections), perspectives (each actor has their own unique perception of the situation) and boundaries (agreeing on scope, scale and what might constitute an improvement). Recognising these various influences is crucial, given the complex ways in which people make decisions. Evaluate – If we are to improve the way we look to influence positive change then we need to understand the complex range of factors that affect stakeholder behaviour, and good evaluation provides a way of doing so. As David Pollock points out, “although there will always be a healthy tension between evidence-based policy and innovation-based policy, our collective mission should be evidence-based innovation”. Building the capacity to reflect on action so as to engage in a process of continuous learning is increasingly seen as an important aspect of behavior change, and it is beginning to be used in many models of changing professional practice. However, it is not a conscious behavior for many teams, and effort needs to be put in to provide teams with tools that can support reflection. These tools are usually known under names such as After Action Review (AAR) or Learning Debriefs, and are used by to capture the lessons learned from past successes and failures, with the goal of improving future performance. The complexity and uncertainty of challenges such as welfare, health, crime, employment, education and the environment demand that our systems of governance and our policies be adaptive. Policy responses in these areas should be designed to both reflect local contexts and adapt as conditions change. In fact, instead of helping, governance and policy that are not adaptive could actually hinder the ability of households, communities and businesses to cope with and adapt to change. Frameworks such as the 6 E’s can be seen as a communication tool for the co-design of policies that offer a way to actively engage a range of stakeholders to find solutions for complex water management issues. Another year has passed, and this provides a good opportunity to reflect on what content resonated most with visitors on the Learning for Sustainability (LfS) site in 2017. So – based on the site statistics* – here are the most visited pages in terms of topic areas, blog posts and downloads of hosted content. The Learning for Sustainability (LfS) website operates as an international clearinghouse for on-line resources around collaboration, social learning and adaptation. As you can see from the navigation bar above it provides pages of annotated links pointing to targeted resources on a range of relevant and interlinked topics. During 2017 the site averaged more than 900 visits* each day. Managing collaborations, complex problems, Theory of Change, systems thinking, and reflective practice featured heavily in the most requested content. Theory of change (ToC). This page provides links to guides for using ToC – a methodological approach for planning, participation, and evaluation. It shows how its use can help orient diverse program stakeholders to work together and plan for outcomes by envisaging a ‘big picture’ view of how and why a desired change is expected to happen in a particular context. Systems thinking. This page points to sites providing toolkits and tools to support systems thinking. It encourages practitioners to understand and analyse the contexts within which they operate, as a precursor to designing programs/policies that can adapt as conditions on the ground change. Selecting evaluation questions and types. This page provides guides to help program managers to develop appropriate evaluation questions that are driven by funders, project participants and other key stakeholders. Further links highlight how different evaluation types (and/or methods) are distinguished by the nature of the questions they attempt to answer. Some of our most popular and engaging content in 2017 was, not surprisingly, blog posts that provide introductory material that grounds key topic areas. Check out these posts that were most popular with readers in the last year. Complicated or complex – knowing the difference is important. This post reminds us that understanding the difference between complex and complicated systems is becoming important for many aspects of management and policy. Each system is better managed with different leadership, tools and approaches. This post outlines the differences, and provides an introduction to management tools and leadership tasks best suited for complexity. 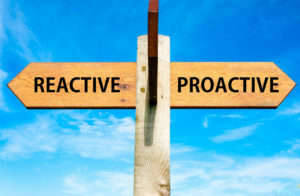 After action reviews – and how they can be linked with ToCs to support strategic thinking. This post introduces After Action Reviews (AARs), and indicates how theories of change (ToC) and AARs can be used in tandem to create both the space and guidance for strategic learning, and subsequent adaptation and innovation. Using a theory of change (ToC) to better understand your program. This post provides a brief introduction to the language and concepts of Theory of Change or program theory. It also looks at how the use of these outcomes-based approaches helps those involved with program learning, planning and evaluation. How Decision Support Systems can benefit from a Theory of Change approach. This 2017 research paper begins by describing a ToC and how it can be used in conjunction with DSS development. We then illustrate how to apply a ToC approach using a pest (rabbit) management example in Australia. We end with a discussion of potential benefits and challenges from using the approach. Stakeholder analysis. This 2010 book chapter reminds us that a stakeholder analysis is just one (albeit usually the first) step in building the relationships needed for the success of a participatory project or policy. It covers steps in conducting such an analysis, and then outlines some best practice guidelines. Building resilience in rural communities. This 2008 report aims to provide a toolkit outlining ideas and information that could be included in new or existing social programs. It introduces and expands on 11 resilience concepts found to be pivotal in enhancing individual and community resilience. This post looks more specifically at outcomes, and how they can be developed and written. It highlights the benefits of focusing on outcomes for project planning, implementation and evaluation. It also provides some tips and ideas for involving program staff and stakeholders in developing and working with outcome statements. Until recently, the performance of many public sector programs has been judged largely on inputs, activities and outputs. Over recent years this approach has been increasingly questioned as being too concerned with efficiency considerations, without a corresponding focus on what benefits are actually arising from program funding and activities. Increasingly the trend is moving towards a focus on the specification and achievement of outcomes, revealing more about how effective programs are in achieving real development changes on-the-ground. Outputs are the goods and services that result from activities. Outcomes are the constructive impacts on people or environments. In the past planning and evaluation has tended to focus on program outputs, or how we keep ourselves busy – the ‘what we do’ and ‘who we do it with’. This enables us to tell our partners, funders and stakeholders about what the program does, the services it provides, how it is unique, and who it serves. We can describe and count our activities and the different goods and services we produce. Now, however, we are being asked what difference it makes! This is a question about outcomes (see figure). Outcomes are the changes, benefits, learning or other effects that happen as a result of what the program offers or provides. Outcomes are usually specified in terms of either: i) social and organizational capacities (social outcomes – e.g. learning, understanding, perceptions, attitudes and behaviors), or ii) state conditions (the bio-physical, ecological, social or economic changes in a system). While most people intuitively appreciate this distinction between outputs and outcomes, experience in results-oriented training sessions suggests that for many program staff, turning that appreciation into practice takes time. As the Keystone (2009) guide points out it takes most people quite a lot of conscious practice before they start thinking in terms of outcomes, rather than outputs or needs or activities. An outcome statement describes a result – a change that has taken place. It is not a needs statement, or an activity that is still in progress. 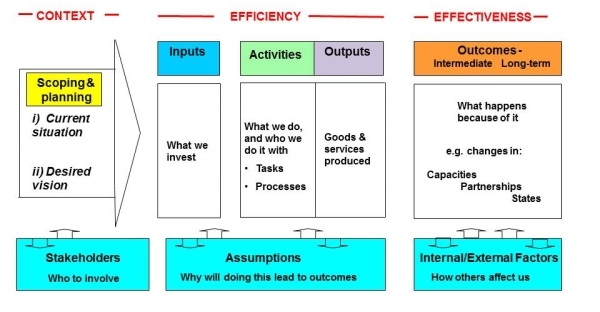 Outputs comprise the products and activities that you do, while outcomes are what we see as a result of our outputs.) One simple test is to ask two questions of each statement: i) is it written as an outcome? and ii) does it describe changes that we can plausibly enable or facilitate in people, groups, institutions or environments? Outcomes may be specified in different ways. Often a distinction is made between short-term, intermediate and long-term, or just intermediate and long-term. Short-term outcomes can be seen as the immediate difference that your program makes in the wider environment. A long-term outcome often has a number of short-term and intermediate outcomes that together contribute to the ultimate achievement of the long-term outcome. Collectively these outcomes should contribute explicitly to the wider vision underpinning program development. An intermediate outcome is a specified intermediate state that contributes to the desired long-term outcome – a step along the way. Intermediate outcomes are especially useful when time lags in measurable state outcomes are significant or limit timely response. The program outcomes and intermediate outcomes should be structured in a logical hierarchy reflecting how each leads to another and/or contributes to the long-term community outcome(s). A useful way of doing this is to take each outcome and ask the question, ‘If we achieve this, what will it lead to and how will it contribute to the long-term outcome?’ Look for gaps – starting from the highest level outcome and working down the outcomes model. A test is being able to read an outcome and say, ‘Yes, this will likely be achieved if all of these initial (contributing intermediate) outcomes (and corresponding outputs) are achieved.’ The answers to these questions will enable you to draft a succinct statement of each outcome. Each outcome statement should therefore define what will change as a result of an intervention and by how much (or, at the very least, in what direction the change will occur). This then allows the means of performance measurement to be defined. The more clearly an outcome statement specifies a desired change, the easier it is to define an appropriate indicator or indicator set. It is not always easy to identify outcomes, and harder still to clarify them, but there are a number of key questions that can help. For example, begin by asking what is/will be different as a result of the initiative? For whom? What will be changed/improved? What do/will beneficiaries and other stakeholders say is the value of the program? For an existing program, look at the major activities. For each activity, ask yourself, ‘Why are we doing that?’ Usually, the answer to the ‘Why?’ question is an outcome. Most importantly, seek ideas and input from others. Their perspectives will help provide a broader understanding of the program and its benefits. This activity will also help build consensus among key program stakeholders. When writing outcomes be sure to describe the desired change. Keep your outcomes SMART: Specific, Measurable, Achievable, Relevant, Time-limited. Say ‘what’, not ‘how’ – Establishing the means and plausibility of the ‘how’ is a later step. Consider whether outcomes are likely to be achieved in the program time frame. This post provides a short introduction to the language and concepts of outcomes. Links to a wealth of information, tips and guides from around the world can be found from the LfS Managing for outcomes: using logic modeling webpage. The previous post looked at the benefits of using a Theory of Change (TOC) to better understand your program or project. This post will look at how to use post-it notes and an expanded logic model framework to involve stakeholders in beginning to develop this bigger picture. Often rallying participants around the development of a visual logic model is a good place to begin the development of a theory of change. The use of key headings and post-it notes makes it easy to provide a structure to help people develop some early models that contribute directly to their program planning, and build confidence and capacity in the use of TOC outcomes-based approaches. Logic models are narrative or graphical depictions of processes in real life that communicate the underlying assumptions upon which an activity is expected to lead to a specific result. There are four components commonly included in logic models (Fig. 2). These are the four primary components of the project or program itself – inputs, activities, outputs and outcomes. There are also four supporting activities which encourage participants to think more carefully about the underlying theory of change that they are planning to use. These supporting activities are: i) an outline of the current situation and desired vision; ii) stakeholder analysis, to identify which stakeholders should be involved in model development; iii) the scoping and planning exercise that underpins any model development; ensuring that underpinning assumptions are documented; and iv) noting internal and external factors – including related activities – that may influence outcomes. There is no single or correct way to draw a logic model. It can be drawn horizontally (as in Fig. 1) vertically, or even in a more free-form fashion. Ideally, a logic model should be able to be displayed on a single page with sufficient detail that it can be explained fairly easily and understood by other people. Much of the value of a logic model is that it provides a visual expression of our underlying beliefs about why the program is likely to succeed through one step leading to another. Thus, each step between an activity and an output or between an output and an outcome can be thought of as an ‘if this happens … then that is likely to happen’ statement. For large or complex programs, the logic model may be divided into more detailed sections or sub-models. These may be summarized by a less detailed ‘overview’ model, often given on the first page, that shows how the component sub-models fit together into a whole. As an example, Fig. 2 illustrates the main program logic elements set out in a horizontal fashion. The inputs are the resources used to resource the activities, produce the program outputs, and ultimately contribute towards desired outcomes. Inputs typically include such things as money, staff, and equipment/infrastructure. Inputs are usually measured as counts, such as hours of staff time, dollars spent, etc. Activities are the actual interventions and actions undertaken by program stakeholders, staff and agencies to achieve specified outputs. Activities can range from writing a memo, to holding workshops, to creating infrastructure. Activities are usually measured in terms of number of things done – e.g. x meetings held with communities. Outputs are the tangible results of the major activities in the program (the goods and services produced). They are usually measured by their number – e.g. reports produced, newsletters published, numbers of field days held. Collectively the inputs, activities and outputs define what the program does, and how efficient it is in managing those elements. Outcomes represent the effectiveness of the program – are the desired states of the community, biological system or production sector achieved by the program. Outcomes may be specified in terms of short-term, intermediate and long-term, or just intermediate and long-term. A long-term outcome will usually have a number of intermediate outcomes that together contribute to its ultimate achievement. The diagram above also shows the supporting information and activities that help the model (and the intended program) to be understood in its wider context. Starting out with outlining a planning and scoping phase helps participants to clearly define the problem or need, and the desired outcome. An ‘issue’ statement should explain briefly the current situation: what needs to change; why is there is a need for intervention; and, what problem/issue does my program aim to solve? This requires that ‘who, what, why, where, when, and how’ are all considered in relation to the problem/issue. Then, the overall purpose of the program needs to be defined. What are you trying to accomplish over the life of the program and beyond? The answer to this question is the solution to the issue statement, and will serve as the program’s vision. The program vision serves as a reference frame for all elements of the logic model that follow. Involving your key stakeholders (see the accompanying resources on stakeholder mapping and analysis) in the process of developing an outcomes model provides an opportunity to engage them in a discussion about the program and to get their input to the process. The link between a program’s activities and outputs and its desired outcome is based on the assumptions that explicitly, or implicitly, are built into your program theory. Your program theory (or theory of change) sets out why you believe that the successful delivery of the program’s activities and outputs is expected to lead to the desired change (the predicted outcomes). It is important to document the program rationale – the beliefs about how change occurs in your field, based on research, experience, or best practice. This needs to be followed by identifying the corresponding assumptions that are built into the program rationale and to acknowledge and document where uncertainties exist. A final discussion can help participants to take account of the risks and opportunities facing the program. These can derive from both internal and external factors. Programs that are operating in complex environments cannot control all the factors that will influence how, when or even if they reach their goals. Therefore it is also important to be aware of similar or related external initiatives that will impact on the final outcomes. This is important in terms of attribution – how to ascertain how much impact can be attributed to your program. It also provides the opportunity to look for other initiatives to link and integrate with, to develop useful synergy and maximize the overall influence of the program. Internal factors might relate, for example, to staff and stakeholder capacities. Three key reasons for using logic models in program design are that they: i) helps you understand why and how something works; ii) provide a guide for implementing useful monitoring and evaluation systems; and iii) help you tell the story of your program quickly and visually. Logic models are most useful when they are developed at the beginning of a program. In this way they can be used to plan how resources can be coordinated and even inspire particular project strategies. They can also at this stage help set realistic expectations for outcomes, bearing in mind that the ultimate desired end-state outcomes of an initiative can often take many years to emerge. Their initial development helps subsequent evaluation as once a program has been described in terms of a logic model, it is then possible to identify meaningful and easily measurable performance indicators. Finally, the simple, clear graphical representation that a logic model provides helps with program communication, and can serve as the basis for expanding the underlying TOC. Start with ensuring a common understanding of the current situation and a shared vision: It’s important to know where you are, and where you are trying to get to. These positions will have often been expressed in already published documents, mission statements, etc. The important thing is to ensure that there is some common understanding around the problem and the desired outcomes among all those that you are trying to work with on your journey. Involve stakeholders: A strong focus on the process of developing a logic or outcomes model (rather than seeing it as just a task to complete) can increase engagement in the program. Building a logic model provides an opportunity, often rare in the everyday provision of services, to involve stakeholders in a discussion on what it is about the planned initiative that is most meaningful to constituents. Keep the model simple: Concentrate on the most important activities and outcomes, and cut back on detail. Describe your activities and outcomes in language that is understood by a wide range of stakeholders. This lets your logic model provide a common picture of your project that is easily understood. It’s important to get an overview of the model on one page that can be used as a communication aid, and more detail can be added behind it if necessary. Minimise the use of arrows: In complex situations there are always many links and potential feedback loops between the boxes on the page. It is often enough to indicate the general movement of time and direction of the model. Avoid siloed thinking: Don’t just include steps and outcomes that are measurable or which you can absolutely prove you changed (attributable to you) – these may not end up being the most important part of the programme. Similarly don’t force lower steps to only contribute or influence a single higher-level step or outcome. Most elements influence a number of things in the real world. Work constructively with disagreement: Although it might be difficult, keep key stakeholders involved, including staff, program participants, collaborators, or funders. Take time to explore the reasons for disagreement about what should be captured in the logic model. Look for the assumptions, identify and resolve disagreements, and build consensus. More information: Often people talk about logic models and theory of change processes interchangeably. Logic models typically connect programmatic activities to client or stakeholder outcomes. But a theory of change goes further, specifying how to create a range of conditions that help programmes deliver on the desired outcomes. These can include setting out the right kinds of partnerships, types of forums, particular kinds of technical assistance, and tools and processes that help people operate more collaboratively and be more results focused. This post provides a short introduction to the language and concepts of Theory of Change or program theory. It looks at how the use of these outcomes-based approaches helps those involved with program learning, planning and evaluation. Subsequent outcomes-based posts look more specifically at developing logic models and working with outcomes. Community-based change initiatives often have ambitious goals, and so planning specific on-the-ground strategies to those goals is difficult. Likewise, the task of planning and carrying out evaluation research that can inform practice and surface broader lessons for the field in general is a challenge. A Theory of Change approach provides a framework which encourages program staff and stakeholders to develop comprehensive descriptions and illustrations of how and why a desired change is expected to happen in a particular context. It is outcomes-based, and helps those involved to clearly define long-term goals and then map backwards to identify the necessary preconditions that will be required for success. Theories of change are vital to program success for a number of reasons. Programs need to be grounded in good theory. By developing a theory of change based on good theory, managers can be better assured that their programs are delivering the right activities for the desired outcomes. And by creating a theory of change programs are easier to sustain, bring to scale, and evaluate, since each step – from the ideas behind it, to the outcomes it hopes to provide, to the resources needed – are clearly defined within the theory. Often people talk about logic models and theory of change processes interchangeably, Logic models connect programmatic activities and outputs to client or stakeholder outcomes. But a theory of change goes further, specifying how to create a range of conditions that help programs deliver on the desired outcomes. These can include setting out the right kinds of partnerships, types of forums, particular kinds of technical assistance, and tools and processes that help people operate more collaboratively and be more results focused. The importance of the concept was well illustrated in a 1995 paper – Nothing as Practical as Good Theory: Exploring Theory-Based Evaluation. In that paper, Carol Weiss, hypothesized that a key reason complex programs are so difficult to evaluate is that the assumptions that inspire them are poorly articulated. She argued that stakeholders of complex community initiatives typically are unclear about how the change process will unfold and therefore place little attention to the early and mid-term changes that need to happen in order for a longer term goal to be reached. The lack of clarity about the ‘mini-steps’ that must be taken to reach a long term outcome not only makes the task of evaluating a complex initiative challenging, but reduces the likelihood that all of the important factors related to the long term goal will be addressed. Weiss popularized the term ‘Theory of Change’ as a way to describe the set of assumptions that explain both the mini-steps that lead to the long term goal of interest and the connections between program activities and outcomes that occur at each step of the way. She challenged designers of complex community-based initiatives to be specific about the theories of change guiding their work and suggested that doing so would improve their overall evaluation plans and would strengthen their ability to claim credit for outcomes that were predicted in their theory. Over subsequent years a number of evaluations have been developed around this approach, fueling more interest in the field about its value. A theory of change is usually presented in a visual diagram (or logic model) that allows the reader to see the big picture quickly. It does not usually provide a specific implementation plan. The purpose of the process is to allow people to think about what must be changed before doing it. Theory of change is both a process and a product (Vogel 2012). At its simplest, theory of change is a dialogue-based process intended to generate a ‘description of a sequence of events that is expected to lead to a particular desired outcome.’ This description is usually captured in a diagram (or logic model) and narrative to provide a guiding framework of the change model showing how and why the desired goals can be reached by the project team and stakeholders. Acknowledging ToC as a process reminds us that a ToC inquiry is an ongoing process of analysis and reflection. It is not a one-off exercise to design (or evaluate) an initiative, but implies an ongoing learning and adaptive management cycle. a diagram (logic model) and narrative summary that represents the sequence and captures the discussion. The main benefit of theory of change comes from making different views and assumptions about the change process explicit, especially seemingly obvious ones. A good theory of change can specify how to create a range of conditions that help programs deliver on the desired outcomes. These can include setting out the right kinds of partnerships, types of forums, particular kinds of technical assistance, and tools and processes that help people operate more collaboratively and be more results focused. The purpose of doing so is to help program staff and stakeholders to check that programs are appropriate, debate them and enrich them to strengthen project design and implementation. For this reason, theory of change as a process emphasizes the importance of dialogue with stakeholders, acknowledging multiple viewpoints and recognition of power relations, as well as political, social and environmental realities in the context. Subsequent outcomes-based posts look more specifically at developing logic models and working with outcomes. A range of links to online material can be found from the Theory of Change page and the related Managing for outcomes: using logic modeling page.